This is a recipe from America’s Test Kitchen’s 2007 annal. It’s quite easy to make, and since any combination of stone-fruit/berries can be used, it’s very, very useful. And delicious. And Sharalee, I hope you’re impressed I got it up this quickly! 2. Mix the sour cream and water in a small bowl until combined. Add half of the sour cream mxiture to the flour mixture; pulse for three 1-second pusles. Repeat with the remaining sour cream mixtures until the dough just comes together, about five 1-second pulses. Turn the dough out onto the counter and flatten into a 6″ disk. Wrap the disk in plastic wrap and refrigerate for at least 1 hour before rolling. 3. When ready to roll and bake the tart, adjust an oven rack to the middle position and heat the oven to 400 degrees. Remove the disk of dough from the refrigerator and roll it out between 2 large sheet sof parchment paper or plastic wrap to a 13″ circle (if the dough becomes soft and/or sticky, return it to the refrigerator until firm.) Slide the dough, still between the sheets of parchment paper, onto a baking sheet and refrigerate until firm, about 20 minutes. 4. For the filling: Discard the top sheet of parchment paper. 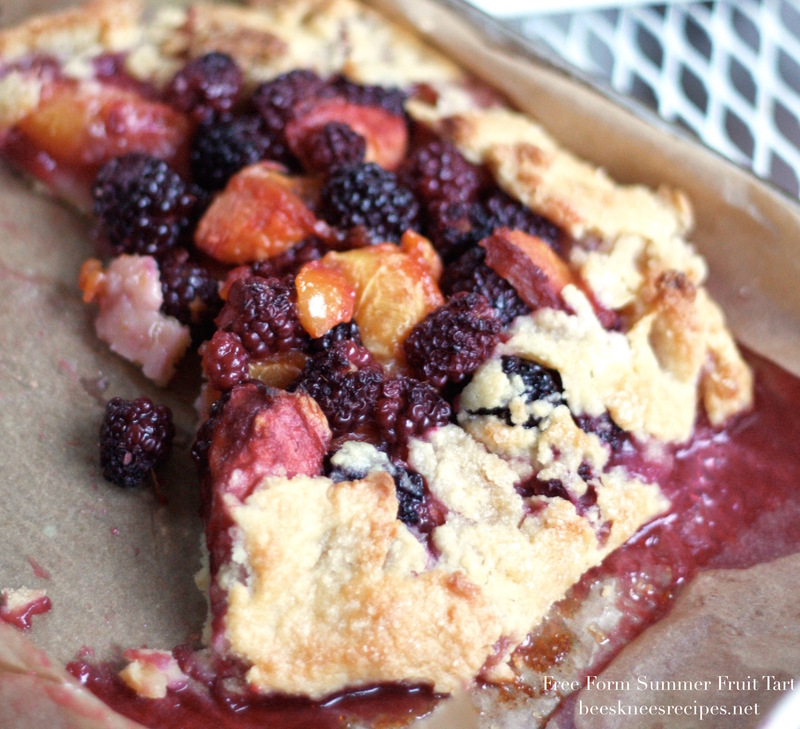 Pile the fruit in the center of the dough, leaving a 2-3″ border. Sprinkle 1-2 T. of the sugar over the fruit and dot with the butter. 5. Fold the edges of the dough over the fruit. Brush the top of the tart with the water and sprinkle with the remaining 1 T. sugar. Bake until the crust is golden brown and crisp and the fruit is bubbling, about 40 minutes. Transfer the baking sheet with the tart to a wire rack and cool for 10 minutes. Slide the tart off the baking sheet and cool on the rack until warm or room temperature before serving. Exceptionally good with a dollop of whipped cream.